Prospect Mold & Die Company was founded in 1945 by William P. Wright, William Dalcher and Walter Nagel. Mr. Dalcher left the company shortly after it was started for personal reasons, and William Wright and Walter Nagel continued running the business as 50/50 partners. 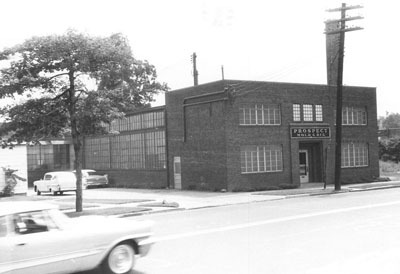 The company began operations in a garage located at 22 Prospect Avenue in Cuyahoga Falls, Ohio. The garage had no cranes or running water. William and Walter had to use the facilities of a tavern across the street. In 1946, they constructed the first building with cranes and restroom facilities. The original size was 42 X 72 feet. 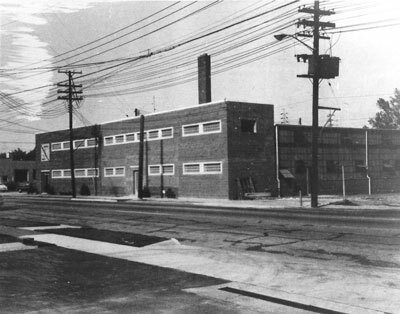 Prospect Mold & Die Company was incorporated in July of 1948. 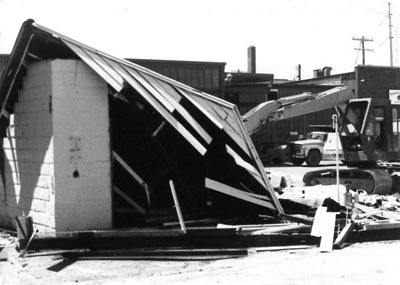 In February of 1950 the company expanded its facility with an addition 20 X 40 feet. The company went on to expand ten times over 40 years to a combined total square footage of 22,404. The last addition was completed in 1985. 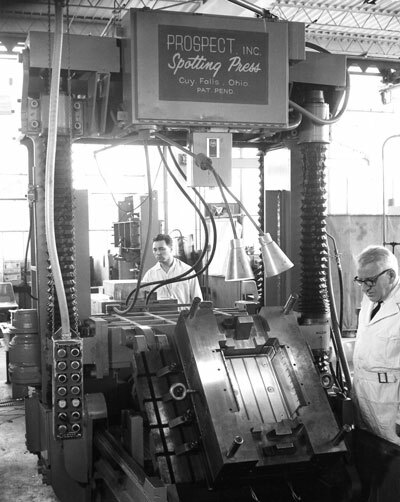 In the early 60s Prospect Mold developed a four-corner hydraulic spotting press to assist with fitting and turning molds. The press was taken to the Chicago Tool Show for display. It was the first press manufactured to flip molds, making cores and cavities accessible looking into the cavity surface as they were worked on. Prior to this, an employee had to work on one half of a mold while lying on his back. 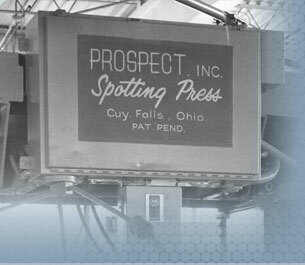 Prospect sold a total of five presses and discontinued manufacturing them due to the cost. Today there are several manufacturers of fitting presses. 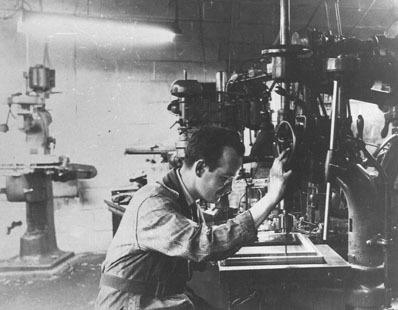 In 1972 Prospect Mold entered into an agreement to purchase a four-spindle Rigid duplicating machine made in Switzerland. This was the most expensive machine the company had ever ordered. The significance of this purchase is that it opened the doors for lens molds with Guide Lamp, a division of General Motors at that time. It gave the company the ability to cut two right- and left-hand cavities at the same time. It was the beginning of Prospect Mold becoming an leader in producing automotive lens molds. January of 1974, Walter Nagel retired and William Wright became the sole owner of Prospect Mold & Die Co. Walter and Bill had a tremendous partnership which lasted 29 years. In February of 1974, Bill Wright’s son Bruce Wright came to work for Prospect Mold after graduating from Ohio State University. Bill Wright believed in learning the business from the ground up, so Bruce was enrolled in the National Tool & Die apprenticeship program. He was trained in all aspects of the company and worked in every department. Bruce became an officer of the company in 1979. In 1995 Prospect designed the first five-color lens mold ever made in North America. Ford of Germany stated that no American shop was capable of making such a mold. The mold was extremely successful and produced good parts at the first tryout. It was the success of this tool that propelled Prospect Mold as a technological leader in multi-color tools for the automotive industry. In February of 1996, Thomas M. Orr purchased shares in Prospect Mold and became the third partner. Tom Orr and his partner formerly owned a very successful plastic injection molding company. Tom and Walt Hall sold their company to a competitor a few years prior to Tom coming to work for Prospect. Their company, ORHA industries, had been a customer of Prospect for some 20 years. Tom came to Prospect with a strong financial background to help Bruce grow the company. It wasn’t easy for Bill Wright to accept a non-family member as a partner, but he recognized it was best for the future of the company. My father never wanted to retire because he loved the business. He was very proud of the fact that over 15 different shops were started from employees who left Prospect. He built Prospect Mold in a small garage with hard work and sweat. He had a strong will, nerve, honor, integrity, wisdom, and the knowledge that mistakes were inevitable but not necessarily tolerable. My father was passionate about the company until the end. He loved coming to work every day to spend time with employees and see the changes in technology. He claimed he was going to stay until we moved into a new facility, but unfortunately he never saw it. Prospect Mold will always be what Bill Wright built with guts, skill and determination. In January of 1997 Prospect Mold entered into an agreement to acquire Akromold. Akromold was a larger company located less than a mile from Prospect. 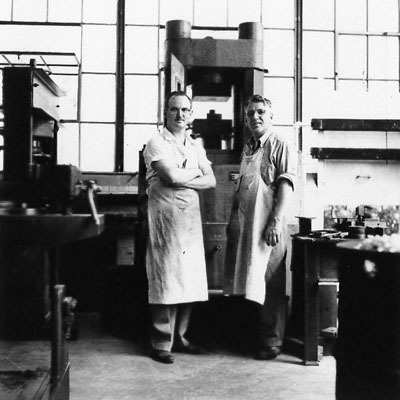 The acquisition brought together two well-known mold-making companies. 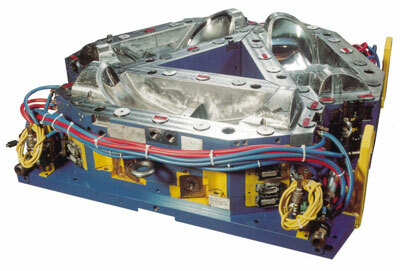 The companies had many similar customers, but Akromold manufactured larger molds and was also in the Aerospace industry. At the time of the purchase, Prospect Mold had annual sales of $10,000,000. Prospect Mold changed its name to Prospect-Akromold to help with the retention of both companies’ customers. In 2002, Brandon Wenzlik joined Prospect Mold as the vice-president of program management and engineering. Brandon worked for six years for another successful mold shop in Michigan after graduating from Ferris State in Big Rapids, Michigan. In 2005, Prospect Mold made the decision to diversify their strengths and branch out beyond molds and dies. With the purchase of their first 5-axis milling machine, they started building tooling for the composites industry. In 2007, after great initial success in the composites tooling industry, Prospect acquired additional five-axis machines and began tight-tolerance machining of carbon fiber aerospace parts. In 2010, Bruce Wright and Tom Orr promoted Brandon Wenzlik to President of Prospect Mold. Bruce assumed the title of CEO and Tom CFO of Prospect. The company remains strong today after 67 years of business and has annual sales of over $25 million. In July of 2014, after a period of very strong growth, Mr. Wright and Mr. Orr sold the majority of their shares of the company to Cognitive Capital Partners. Mr. Wright retired from the business but remains a shareholder and board member. Mr. Orr continued to work full time until January of 2016, when he began consulting on a part time basis at Prospect. Mr. Wenzlik and his management team continue running the company. Sales growth in 2016 is expected to be near $40 million.